(VEN) - Vietnam’s support industries have tremendous growth potential, but businesses have to improve their production efficiency and management capacity in order to integrate into global supply chains. Domestic businesses are fully capable of creating support industry products that meet quality standards, and are able to participate in global supply chains. However, for the prices to be competitive, they need to improve production efficiency, cut unnecessary costs, and let go redundant workers. Korean and Japanese companies are increasingly interested in Vietnamese products, especially given their improved quality. However, demand-supply connection programs are missing to increase trade efficiency. For example, in October 2018, more than 30 Vietnamese businesses and Japanese companies met and signed contracts to supply engineering support industry products. Support industry businesses have many opportunities to improve their production capacity in accordance with the buyers’ requirements and standards. However, businesses need to grasp opportunities to develop strongly in the current context. Le Nguyen Duy Oanh, deputy director of the Center of Supporting Industries Development under the Ho Chi Minh City Department of Industry and Trade, said demand for domestic support industry products by big foreign-invested companies is large. For example, Samsung Vietnam is striving to increase the number of Vietnamese suppliers to 500 by 2020, with the number of tier-1 suppliers increasing to 50. However, only a small number of businesses have met the group’s requirements. To increase the number of Vietnamese suppliers, the Center of Supporting Industries Development has cooperated with Samsung Vietnam to launch a supporting industry consultant training course for Vietnamese experts. The consultants can help Vietnamese businesses become Samsung vendors as well as further participate in global value chains. The Japan International Cooperation Agency has also supported five support industry companies in Hanoi and five in Ho Chi Minh City, helping them improve production capacity and techniques in order to access global supply chains. 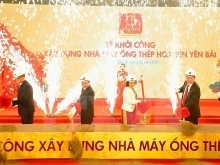 The agency will try to implement additional projects to help the Vietnamese support industries develop.